Baobabs – known as upside down trees – are instantly recognisable for their small crown of horizontal branches and massive swollen trunks. Diego’s baobab is one of six baobab species endemic to Madagascar. Diego’s baobab is found only in a small area in the north of the country where it grows in mixed deciduous forest, particularly over limestone, sometimes growing straight into rocky crevices. It plays an important role in the lifecycle of several other endemic Malagasy species, including fruit bats, sunbirds, hawkmoths and lemurs and is used in several ways by local people. Both the fruit and seeds are eaten locally, the seeds are also used to produce cooking oil and an infusion of the bark has been used as a treatment for diabetes. The fibres from the bark are used to make rope, and are thought to be stronger than other baobab species, fetching a higher price at market. The trunks often become hollow with age and may be used as water cisterns or shelters for people or animals. Being confined to a small area, Diego’s baobab is particularly vulnerable to habitat degradation. Its habitat in the Baie d’Antiseranana region of North Madagascar suffers from deforestation as trees are felled for firewood and charcoal. Baobab seedlings are also failing to regenerate naturally in these areas. 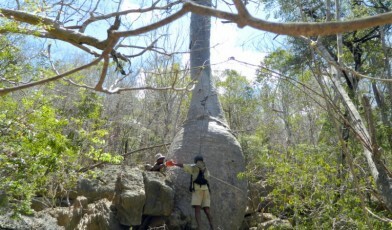 Diego’s baobab and its relative Perrier’s baobab (Adansonia perrieri) are also found in Ankarana National Park. Here the Global Trees Campaign’s partner, Madagasikara Voakajy, is supporting the village-based ‘Comité Locale du Parc’ to patrol the area and protect the mature trees. GE Wickens & P Lowe (2008), The Baobabs: Pachycauls of Africa, Madagascar and Australia. Springer D Baum (1995) A systematic revision of Adansonia (Bombacaceae). Annals of the Missouri Botanical Garden 82: 440-470. This tree profile was researched and written by Beccy Middleton.